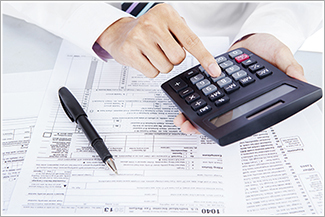 The Indian income tax regulations allow for certain deductions or exemptions for all classes of taxpayers (i.e. salaried Individuals, professionals, businessman etc.). We just need to put in some efforts in understanding the various ways through, which we can claim such deductions or exemptions. Be it a seasoned taxpayer or a first timer; tax planning is essential for all. Planning taxes properly helps in saving a lot of money. The laws governing the taxes seem so complicated that people are scared of dealing with their taxes. However, tax saving is not as difficult as it looks. The profit earned from selling shares or mutual funds can be totally tax-free. The trick is to hold the equity, whether it is shares or mutual funds, for more than one year. E.g., If someone has invested Rs. 1 lac in some stock and in 11 months the value becomes Rs. 1.2 lacs, he/she will have to pay a tax on the profit of Rs. 20,000, but holding it for another month means that there is no need to pay any taxes on the profits. However, the Finance Bill 2018, restricts this exemption to taxpayers whose total profits from such sale does not exceed Rs 1 Lac during a year. Some personal expenses are additionally eligible for reducing your taxable income. These expenses are deducted from your gross salary. The employer can provide leave or travel remittance or meal coupons as part of your salary. There is also a component called HRA (House Rent Allowance). You can claim deduction for the same if you live in a rented house. Whenever you negotiate your CTC with your employer, make sure that you structure your salary in order to include all or most of these components. There are various tax saving investments, which help in saving taxes as well as earning profit. 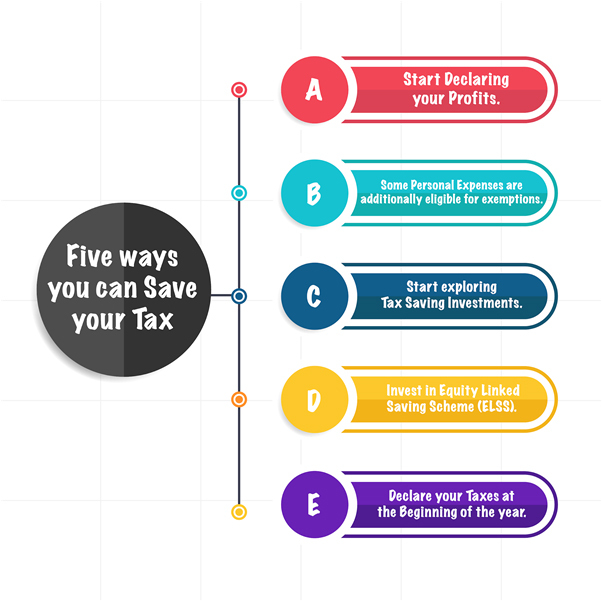 Schemes like Employees Provident Fund (EPF), Public Provident Fund (PPF), National Pension Scheme (NPS), Sukanya Samriddhi Scheme, and so forth are a few various investments in which one can save tax. You can always invest in the Equity Linked Saving Schemes (ELSS). It is an SIP investment in mutual funds with a lock-in period of 3 years. The ELSS invests in the share market and has a potential of providing the highest return. Using this, one can also claim deduction upto Rs 1.5 Lacs under section 80C. It gives the twin advantage of tax exemption as well as capital appreciation. Employers deduct TDS from your salary. Tax Deducted at Source is varies according to the projected tax liability for the particular financial year. If the planned tax savings, investments, and expenses for the year, are not declared properly, the expected tax will naturally be higher. Moreover so, to compensate that, the employer would deduct TDS accordingly every month. It might happen that it will already be too late when you declare all of your tax saving investments. The company may have already deducted more TDS than required. Although, one can always claim tax refund while filing tax returns, why pay extra tax and lose out on the returns on the funds in the meantime? There are many ways to save taxes. You just need to put in some efforts to understand how to do it. Ensure that you never break any laws in the process. While being tax-efficient is smart, tax evasion is entirely illegal and punishable.